Whether you’re going to spend your vacation relaxing on the beach or fishing in the lake, a nice, comfortable chair is something you absolutely need. Unfortunately, with such a huge variety of products out there (good and not so much) it’s easy to make a mistake and buy a low-quality chair that will not be worth its money. For this article we chose and compared only the best beach chairs on the market to make sure you find the one that will perfectly satisfy your needs and make your vacation unforgettable. The Spring-Action Rocking Technology offers a smooth rocking action on any surface. This makes the GCI Outdoor Freestyle rocker model stand out. Another peculiarity of this chair is the patented Easy-fold Technology. It allows you to fold it open and close easily and safely due to the padded armrests, built-in beverage holders and a convenient carry holder. As other high-quality models, GCI Outdoor Freestyle Rocker model is constructed of lightweight and sturdy powder-coated steel. It allows the chair to support up to 250 pounds. This model has a limited lifetime warranty. Make sure that you confirm all the details with the seller when you decide to make a purchase. Unfortunately, we cannot say this chair is our top pick. The lightweight steel construction definitely allows you to easily carry it on longer distances. The problem is that the steel material makes it heat up. So unless you are planning to use this chair in colder climate areas, we do not recommend it. 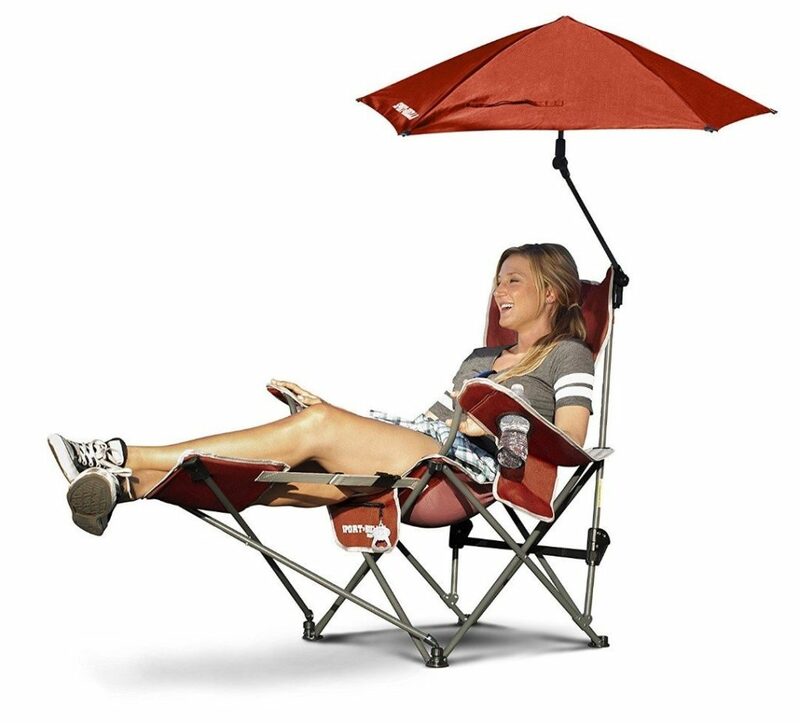 If you are looking for a top-notch beach chair – the Sport-Brella is your go-to. This is a multi-functional model that can similarly be used for any kind of outside event. It is ultra-comfortable and includes some unique features. This Recliner Chair can be reclined in 3 distinctive directions: in a sitting position, lay back, or relax with your feet up. Additionally, his seat has a portable and removable hassock, which makes it a perfect place to take a nap while resting on the beach or fishing. You can use this it for camping or sport events as well. At first sight, it looks bulky, and you might assume that the Sport-Brella recliner must heavy. Well, that’s not exactly the case. The chair has a lightweight construction, which makes it easy to transport. The structure of this model includes an insulated pocket, a cup holder and a storage pocket that can hold up to 4 drinks, so you don’t even have to stand up and interrupt your relaxation. The zippered storage pocket also has its own unique container opener so you will never be stranded again. Have I mentioned how nice it is to have an umbrella covering you from burning sun? This chair covers all the bases. All you have to do is grab a drink and enjoy your comfort. Bottom line: With so many great benefits and no flaws, Sport-Brella recliner chair is definitely our top pick on this list. 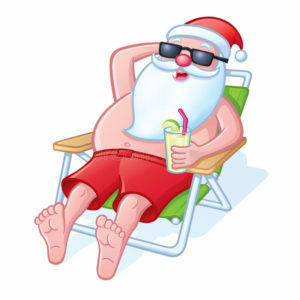 If you are going to spend your vacation on the beach, something you should not forget about is beach safety. It is always a great idea to be prepared in case something goes wrong, so here are some great tips you should keep in mind while resting on the beach or swimming in the sea. If you are looking for a lightweight, ultra convenient chair that provides large storage pouch and also looks nice and neat – then you are at the right place. Rio Beach Boy is a great choice when it comes to outdoor convenience. It is perfectly suited for chilling on the beach, tailgating, having a picnic in the park or camping with your friends, family or coworkers. 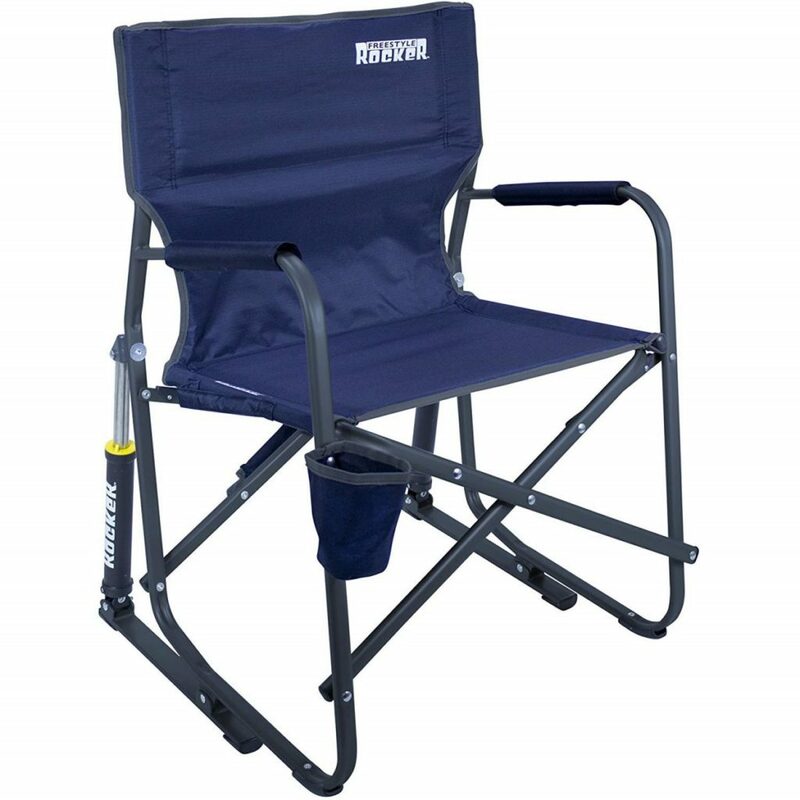 If you need a portable beach chair, then this model is great for you. It comes with convenient, adjustable padded backpack straps. It is interesting that this technology is patented by RIO Beach company. the model offers a removable and adjustable neck pillow. This allows you to find the perfect position for your neck to maximize your convenience. as many other popular models, this chair also provides a cup holder. I am a big coffee lover, so this is my personal favorite part. Even if you are not a coffee type of person – you might want to have a been while camping, or just have a cup of cold water after hiking. a huge back pocket can store up to 3 beach towels in the back. For people with neck pain issues an adjustible neck pillow is the most important feature about a chair. Find out useful tips how to deal with neck pain: 10 Tips how to Prevent Neck Pain. 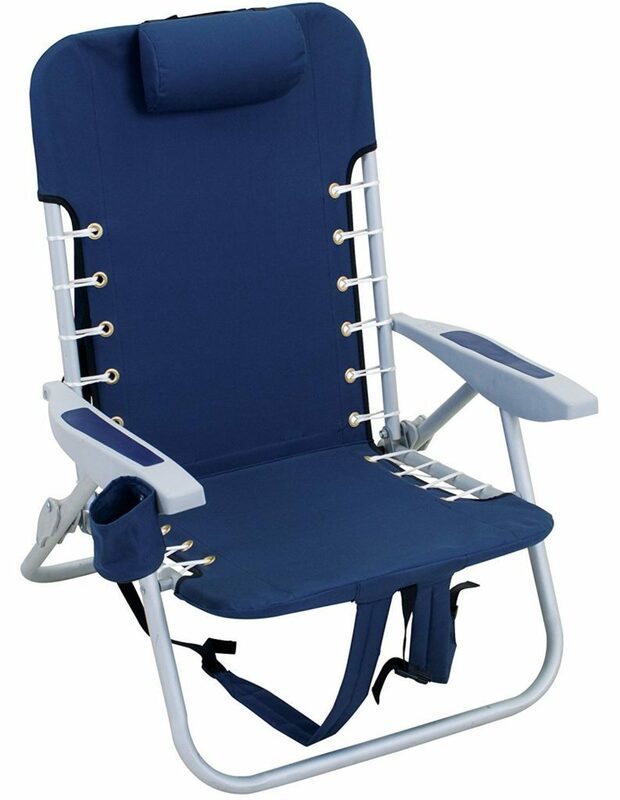 Overall this model has very good customer reviews and is reported to be a better and a cheaper version of the famous Tommy Bahama beach chair. With that being said, let’s not forget that all people are different. Something that I find useful and beneficial, might not necessarily work for you. This model offers a higher and a wider seating, which is absolutely awesome for people with larget body type. But if you are not – then you might not find it that great. Sometimes various chair models share similar features and are different mainly by their dimensions. Since your convenience is the most important factor here, you shouldn’t feel pressured to buy a chair just because it has a big brand name on it. If you are not sure whether this specific model suits you best – don’t hesitate to take a look at other options. If you are the kind of person who loves carrying a lot of stuff to the beach – then this chair is definitely for you. 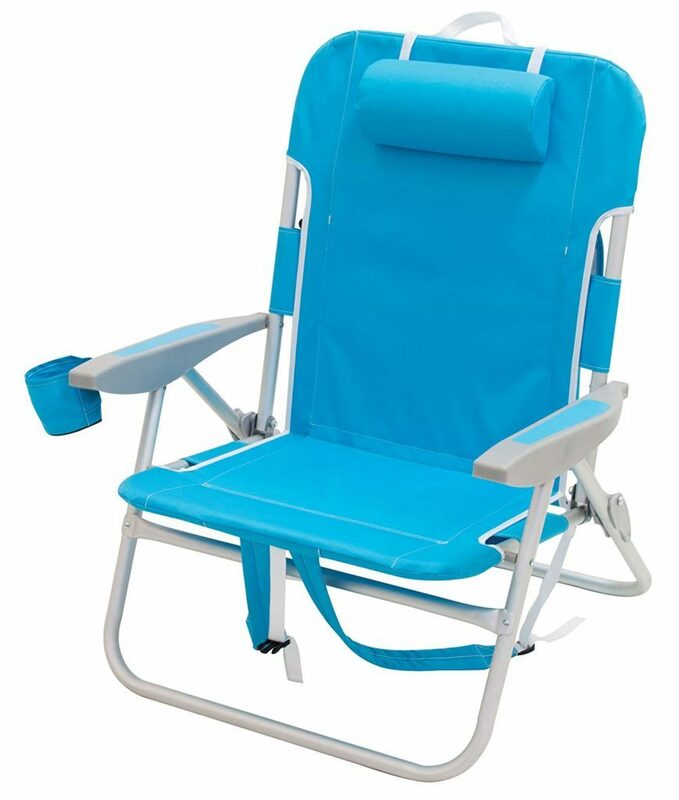 It has a large pouch on the back of the seat, perfect for carrying towels or suntan cream. With this chair you definitely won’t have to worry about losing something. The best part is that the model offers hands-free portability and it’s actually very light for its size. 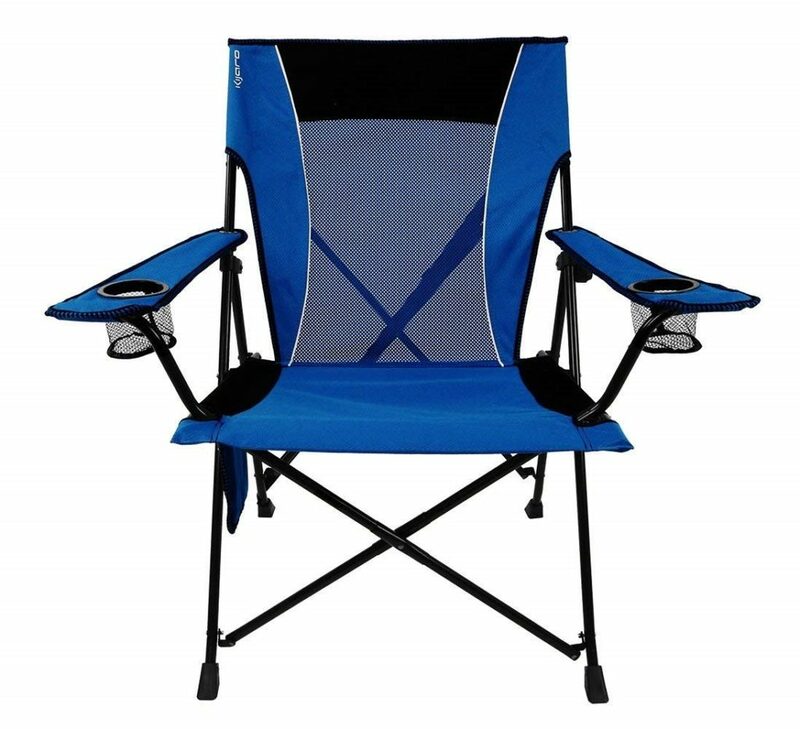 So if you are additionally carrying a tent or an umbrella, then Rio Folding Backpack Chair is the best choice for you. If you happen to get wet under the rain – don’t worry. The aluminum frame is rust-proof and will serve you for a long time. 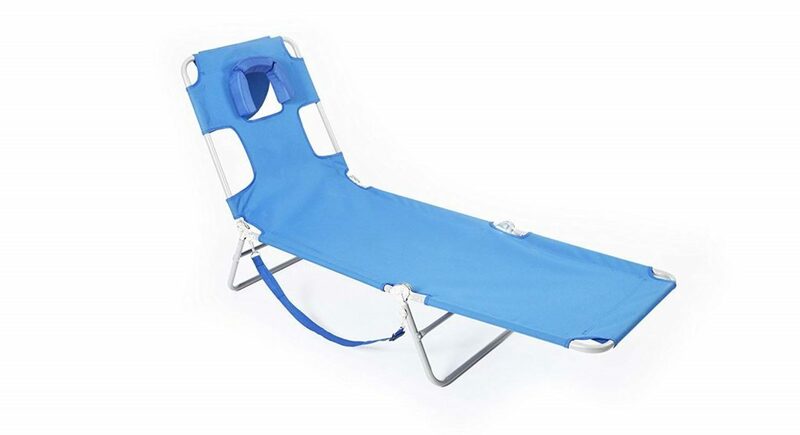 At the same time this is a quite cheap beach chair and if you are on low budget, it is a great option for you. Despite all its benefits, this model is not perfect. Some customers have reported about cheap, thin material. So you should shop carefully and read customer reviews before you make your final decision. Bottom line: for the money you pay you definitely receive a great product with multiple benefits. With a durable diamond ripstop polyester and a breathable mesh on the back of the seat, you will experience a premium seating experience. Kijaro dual lock can support up to 300 pounds, so it works great for bigger people as well. With locks open, the chair offers extra stability, and for easier transportation, you can just shut the locks. This is the only model that I struggle finding something bad about. The last item on our least is not exactly a chair, but if you are planning to spend a few days resting on the beach, then our Lounge Chaise is definitely worth checking out. The best thing about it is the patented open/close face cavity, along with arm slots and a pillow. It is made of heavy-duty polyester and white powdered steel. The lounge chaise offers the maximum level of comfort because it can be folded in 3 different positions. It is portable and includes a carrying strap. On the other hand, if you are carrying a lot of stuff, this might not be the best choice for you. The lounge chaise doesn’t contain any pockets, so if you don’t have any other place to hide your phone and wallet, there is a chance you might leave something on the beach or someone could even steal it.